R&B Prince Jay-R guides a pool of single ladies in search of a potential mate via GMA-7’s upcoming dating game show, Take Me Out. For one who’s not fond of going out on blind dates, R&B singer Jay-R finds it ironic and interesting that his first solo hosting job requires him to match individuals and turning them into a couple. Jay-R remains dateless, too, since his girlfriend Krista "Krissa Mae" Kleiner has a three-month commitment abroad while he’s setting up contestants for a date here in Manila. Take Me Out, GMA-7’s newest dating game show, is a franchise of the FremantleMedia produced show that originated in the United Kingdom. "Nandito po ’yong executive producer galing London," Jay-R told members of the entertainment press during a set visit recently. "Nandito po siya to oversee the project kasi, siyempre, sa kanila ito so they want to keep the franchise look. They gave me a bunch of tips on how to interact with the girls. Dapat daw ako ang nagdadala nung show." Part of the singer-host’s preparations for the program is honing his ability to speak in straight Filipino. "Kailangan kasi gusto ko mas maka-relate sila [contestants] sa akin," said Jay-R. The challenge for Jay-R is to successfully incorporate local flavor into the show to make it accessible to Pinoy viewers. As the main facilitator, Jay-R will guide 30 single ladies in their quest for Mr. Right. The mystery guy must be able to impress the ladies, whose ages range from 20 to 40, for a chance to take one out on a date. The process, however, looks more interesting than the usual dating game. Each of the ladies is given a designated podium complete with lights. If impressed with the guy, she leaves the lights on. Switching the lights off means she’s asking to be eliminated from the contest, with the chance to spend time with the hopeful bachelor. "Pero it’s all fun and games naman," Jay-R points out. "It’s not really serious... It’s all about having fun and not to embarrass the bachelor." Complementing the show’s unique concept is the state-of-the-art studio with its sophisticated lighting effects and equipment—a vital element to keep the Philippine version in step with its foreign counterparts aired in the Netherlands, Australia, Denmark, Finland, Indonesia, Spain and Sweden. 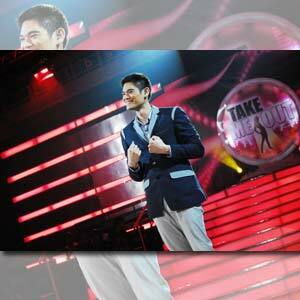 Take Me Out will assume the spot that will be vacated by Family Feud starting on Monday, April 26, on GMA-7.